Pin It Whether you are camping, hiking, traveling, or simply thinking about being prepared; water is a crucial element in life that cannot be gone without for a long period of time. Anywhere from 65% to 90% of the human body is composed of water. We have a perfect line of products to help you meet your water purification needs in camping, hiking, and emergency preparedness. 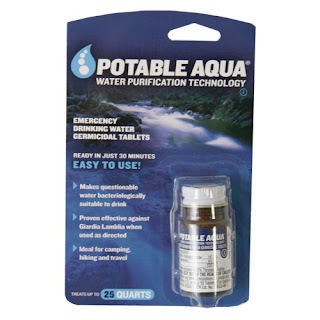 Portable Aqua Water Purification Technology is an excellent solution for water safety for those looking for easy, compact, and light weight water purification system. Though it is not meant for on-going use, it is a perfect solution when you have to obtain safe, drinkable water without having to start a fire. Whether camping, canoeing, hunting, or engaging in any sort of outdoor activity, it pays to be mindful of your water supply. A bottle of Potable Aqua® tablets takes up very little space, weigh less than a pound, and when used correctly will protect you from a host of parasites, viruses and bacteria. The Center for Disease Control and Prevention (CDC) reports that between 30% and 70% of international travelers suffer some form of Traveler's Diarrhea (TD), calling TD "the most predictable travel-related illness." The most common causes of water-borne TD are bacteria, such as E. coli, cholera and salmonella, which are reduced or eliminated by Potable Aqua® Drinking Water Germicidal Tablets. Be conscious of where you are. If you are traveling to a place where indoor plumbing is not widely available, or where monsoons, floods or inadequate water treatment may leave water supplies exposed to pathogens, proceed with caution. Potable Aqua® Drinking Water Germicidal Tablets, when used correctly, can render water safe for drinking. As hurricanes and tsunamis tragically demonstrate, the first things to get knocked out by natural disasters are the electrical grid and the water supply. According to the Federal Emergency Management Agency (FEMA) an adult needs a minimum of a half gallon of water per day just for drinking. So a family of four would require roughly two gallons per day of purified water. When water is scarce, water purification tablets like Potable Aqua® are crucial for an emergency preparedness kit. Portable Aqua Tablets are included in all of our deluxe emergency kits as well as the survivor emergency kits. But if you need the tablets for an addition to your 72 hour kit or for your hiking trip, they are available at www.survivalsuperstore.com. Or click here for a direct link to the product page.